Can Marine Customs Non-Skid Decking be applied over existing non-skid? Marine Customs Non-Skid Decking adheres very well to most molded-in non-skids and properly applied and maintained aggregate type non-skid paints, as long as the surface is cleaned properly. What is the best method to clean Marine Customs Non-Skid Decking? 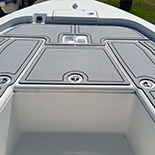 Marine Customs Non-Skid Decking cleans easily with soap, hot water, and a soft bristled brush. A number of household products can be used such as Soft Scrub, Simple Green, 409, bleach, etc. Please do not use an acid based cleaner such as Mary Kate’s Hull Cleaner. Can I get a custom cut product? Yes, if templates or CAD drawings for each part are supplied. If it’s a rectangle such as for a helm pad or bolster, you can supply dimensions or a sketch. Price is determined based on the quantity of sheet materials used in addition to CNC machine time, CAD design hours along with installation labor costs. For a complete and accurate quote, please give us a call so that we can guide you through the process. Five to seven years. Longer if the boat is stored inside. Marine Customs, LLC products are warranted to be free from any defects at the time of purchase. The EVA has a 36-month material and workmanship warranty. The Pressure Sensitive Adhesive (PSA) cannot be covered under warranty due to many outside issues that may be present during installation. 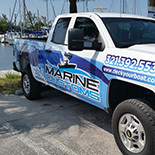 Please work directly with Marine Customs, LLC for any warranty claims as we will need to work directly with the manufacturer. ***Note: because of excessive heating when exposed to sunlight, black is not recommended as a top color. Therefore, it is not covered under the product warranty. 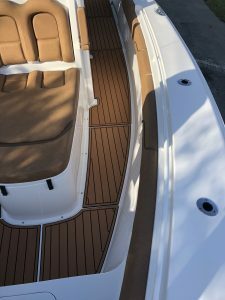 With care, our boat decking is easy to install but consideration should be given in regards to where it is being installed and its exposure to surrounding surfaces. Please refer to the attached documents which include the marine decking warranty, storage, and situations to avoid. Particular attention should be paid to reflective heat. At times, the sun can reflect off surrounding surfaces including vertical surfaces causing damage to the product as well as carpet. The warranty does not include damage caused by reflective heat. Consideration could be given to also applying boat flooring to any vertical surfaces to cut down on reflection. Read our Technical Bulletin here for more information. Can I get a custom sized helm pad? Yes, provide dimensions and a quote will be provided. Can I get a logo on my custom helm pad? Can Marine Customs Non-Skid Decking sheets be seamed? This is not recommended. Even with a very small shrink rate, a small gap between sheets will be present. We recommend leaving a 1/2 inch gap between panels. If proper prepping has been done, you can expect at least 5-7 years of life. Yes, if the edge has slightly come up, use an acrylic based super glue. If the sheet has completely come up, you will have to clean the area thoroughly to remove any existing PSA and reapply another new sheet. Use a plastic putty knife to get under one corner. Grip and pull off. If the EVA seems to be sticking and tearing, use the putty knife to jab the area. You may want to enlist another set of hands to assist. Once the entire pad is removed, there will be a small amount of PSA left on the surface. Soak with mineral spirits for 10 minutes, scrape with the plastic putty knife. Once the PSA has been removed, use acetone to remove the mineral spirits. Use an ammonia based window cleaner and a scotch brite pad to remove any dirt, sunscreen, wax. sweat, etc. Scrub well and let dry completely. If the boat is new, you should repeat several times as new boats have mold release that may hinder adhesion. How do I make patterns for my swim platform, poling or casting platform, cockpit etc.? Determine the layout for your particular application. 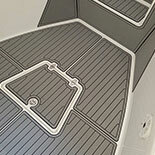 Order a Marine Customs Non-Skid Decking template kit. Create your template and submit it to us for a quote and for digitizing to begin production of your custom project. These kits include the following: Clear Mylar sheets (qty. of sheets will depend on your project needs), marker, data form, template instructions, return shipping label. Once you have received your kit, follow the simple templating instructions provided. Yes, we can CNC or laser engrave logos and text if supplied with vector graphic of logo or given desired text style. How much is it for custom logos? Custom logos start at $75.00. Is the product pet-friendly (dogs)? We cannot warranty the product if it becomes damaged by your pets. Our product is made of an EVA foam material so if scratched at enough, the product will tear or rip. However, under normal usage, since the product is a closed cell foam, you shouldn’t have to worry about the product absorbing anything. What temperature is safe to apply the new product at? Above 70 degrees and dry is recommended. If attended to promptly in most cases you should be ok. Fuel stabilizers, bird droppings, rust, and mustard are known to stain if not attended to in a timely manner. What is the most popular two color pad choice? Dark Gray over Black and Brown over Black are our most popular two color combinations.